Towable 1 Man Auger Rental – Ground Hog HD99, is available for rent in Rochester NY, Ithaca NY and the entire Western New York region from the Duke Company. The rental GroundHog HD99, towable, hydraulic auger can be rented, is powered by a 9 horsepower Honda (or Subaru) engine, and is capable of digging holes 18 inches in diameter. Hydraulics enable the operator to control variable speeds, and also reverse the auger. 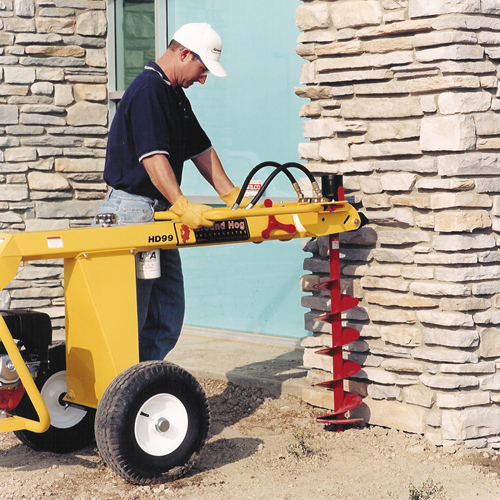 The 8 inch auger has three handlebar positions for drilling under ordinary conditions and also next to walls and fences. Close-up length = 75 inches.